Disclosure: I received the TooFold from Joovy for review. All opinions are my own. If you want people to notice you while you stroll with your babe, check out the Joovy TooFold. It's the ultra-cool stroller that can transform from single to shopper to double quickly while folding into a stand. With a super sleek and modern design, your tot will be cruising in style. It is travel friendly as we took it to Maui for our vacation and easy to use on a weekly basis. The Joovy TooFold is narrow and easy to maneuver and Hubs was proud to push it around when my father-in-law wasn't pushing the kids around. There is no hesitation to sit in the TooFold by either of my kids and they don't fight over who goes in front or back :: what a miracle! 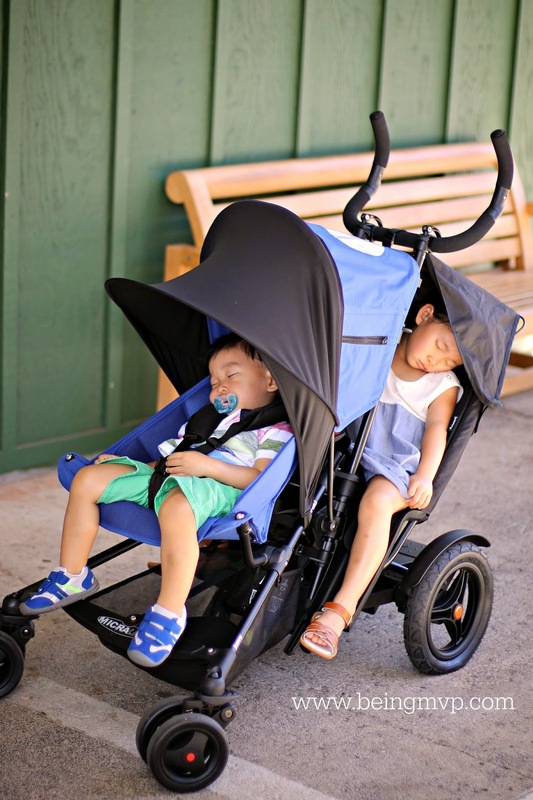 Simply & quickly converts into a double stroller (rear seat sold separately) - I highly recommend getting this especially for when you are out and about for a long time and your child wants a place to sit rather than stand. Extendable wheelbase provides extra space for shopping bag or rear child - great for shopping trips on a mama's day out! Stroller Weight - 23.6 lbs. Front Seat Max Weight - 45 lbs. Rear Stand-On Board Max Weight and Height - 45 lbs. and 44"
Another neat feature is that when your child in the front falls asleep and you want to recline to the lower position (just pull down on the tabs on the stroller frame behind the seat / lift up to bring back to sitting position), your child in the back doesn't lose any of their space (like traditional front seats that recline back). How awesome is that? See how easy it is to use the Joovy TooFold in my video review! 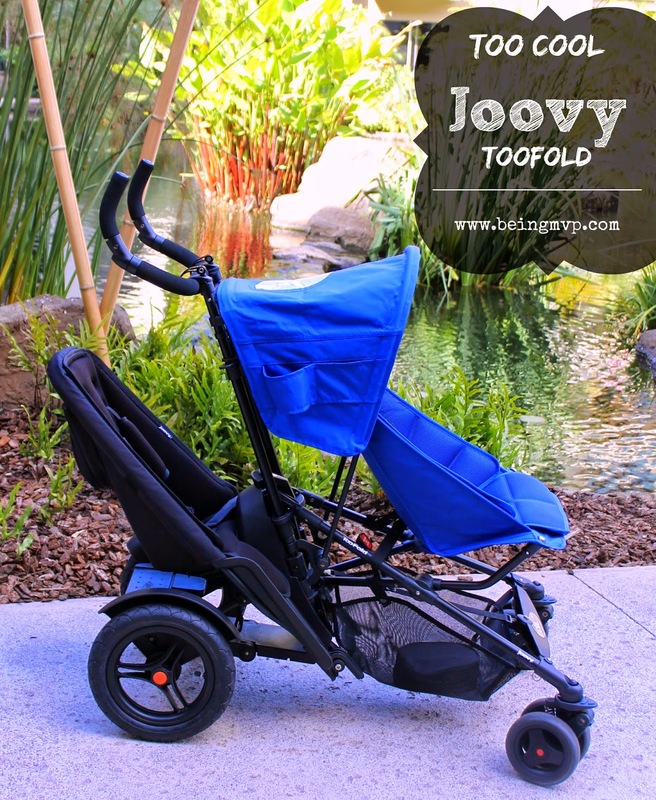 What are some of your favorite features of the Joovy TooFold? That is an awesome stroller and I am loving the color of the one you have. Wow, I can't believe how compact this folds up! It looks like you're getting plenty of use out of your new Joovy. this really does look like the coolest stroller. I have a bulky double stroller right now I want to get rid of. I could really use something like this now that I just had my baby. Love it! I love how it folds up so compactly. That is the best feature to me. That is a neat stroller! It looks like it is perfect for two kids and folds up so compact too. Oh wow, I've never seen anything like that. I like the ease of use and that it's lightweight. I've had my fair share of heavy, bulky, hard to open or close strollers. This looks like something that would work for me. I love the wheels extend for the 2nd seat and the recline feature! I need one of these! What an awesome stroller--I need to invest in a stroller like this for my girlfriend who is having her first baby! She would love this! What a cool stroller. That thing is like a transformer! Talk about multifunctional. I'm all about baby devices that can be customized. The weight and style are perfect! I will be looking into this as my double stroller! Baby 2 is almost here! that is a gorgeous blue and a great review. i love the video. I think this is one of the coolest strollers i've seen in a while! That is awesome, I love my Joovy strollers but this one looks like a must for me. I like how much more compact it is. WOW! You make it look SO EASY! You put on that second seat in seconds! This is definitely the coolest stroller I have seen. I need a double stroller so bad! This would've been ideal when my girls were younger! I hear nothing but good things about Joovy. I saw this for the first time the other day and loved it. It has pretty much all one would need! I need a double stroller like this! I love how one seat is directly behind the other - genius! This is such a neat double stroller! I love that it doesn't take up so much space when folded! This isn't TOO heavy at 23 lbs and I love the design! It is hard to find a good looking stroller for 2. I have a side-by-side design double stroller now and it is hard to fit through the aisles in stores. with a third baby on the way i think i'm going to need this. i have a double, but its big, heavy and just BIG. love the design! The Joovy TooFold looks amazing! I love how compact it is. 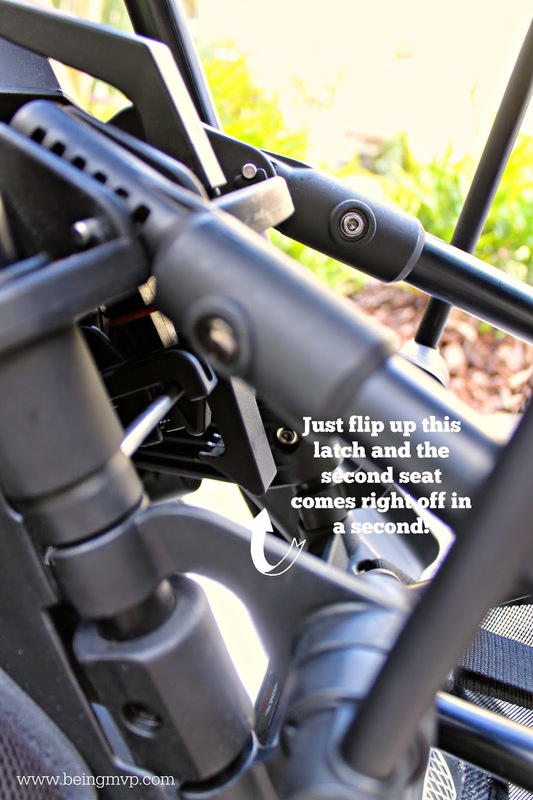 I love the idea of being about to attach a second seat easily and quickly. What a great stroller for young families. That's a way cool stroller. I didn't know Joovy had this stroller. I really like the second seat. OH! I need one of these, my daughter is getting too big to ride in the stroller very much any more. 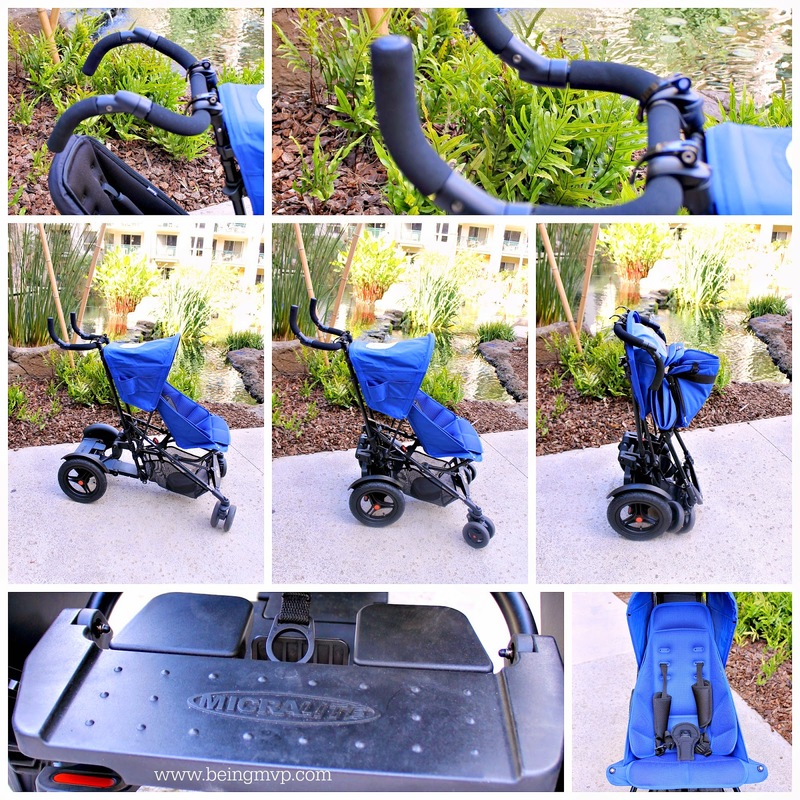 I love that it can be a compact single stroller, or fold out so easily to provide a stand or add a second seat! This stroller looks awesome! Easy to get two kids in there and the features are great! Wow, this is so cool! I love that it can easily accommodate two kids! I needed this with my two girls. I love that it is slim and easy to shop with too.